Engineer Hendrick explains the importance of smoke detectors in the home to our young visitors. 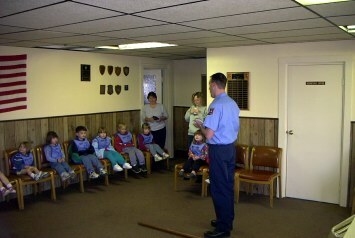 Probationary Firefighter Flint demonstrates how a firefighter searches for trapped people in a fire. 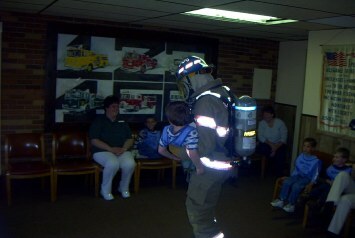 This demonstration helps children recognize firefighters who are wearing all of their gear and to hopefully ease the children's fear of the gear. Probationary Firefighter Flint carries a young "victim" to safety, demonstrating that firefighters are there to help and that the children shouldn't hide from them.